So there I was with my wife at a professional conference in San Francisco, 2200 miles away from our seacoast-less, cable car-less, exotic restaurant-less Midwestern hometown. It was a beautiful sunny day in a fabulous city, and we both had a rare afternoon with nothing planned. Amazingly, she said, "That sounds interesting -- lets do it." After a few phone calls and a cab ride, we found ourselves walking into a high-fidelity store, Audio Vision San Francisco, and shaking hands with a T-shirted and tastefully tattooed twentysomething named Chris. Thankfully, it was a quiet afternoon in the store (the good weather not having escaped the notice of other people in the city), and Chris sat the two of us down in the main listening room. Over the next four hours, he gave us the most expert loudspeaker demonstration Id ever experienced. Powered by remarkable Simaudio electronics (Moon Evolution Series Andromeda CD player, P8 preamplifier, and W8 stereo amplifier), loudspeakers from DALI, Focal, Thiel, and Triangle strutted their stuff with various classical-music selections and jazz vocals from Patricia Barber. Chris described the features of each speaker and went through an impressive setup protocol to optimize the position of each in the room. In the end, with that gear in that room, the Triangles took the honors. There was persuasive bass and lots of it, partially due to well-designed and well-controlled room reinforcement. In the opening notes of "Bye-Bye Blackbird," from Barbers Nightclub [CD, Premonition/Blue Note 27290], we could distinguish the double bass and the piano as they played the same deep notes in unison. Plus, the midrange was full and detailed, and the top end delicate and extended, with great presence. The winner, the Stratos Australe ($5699 USD per pair), is the second from the top of Triangles eight-model Stratos line. The Australe is distinguished from the model beneath it by having a rear-firing tweeter, and from the model above it by not having a rear-firing midrange driver as well. A thicker wallet will get you into Triangles highly regarded Magellan line, which incorporates Triangles latest research and driver technology; a thinner one will restrict you to the Esprit line (notably the Esw Celius), which Triangle claims gives a fair percentage of Stratos performance at a third to half the price. What we have here is . . .
At first glance, the Triangle Stratos Australe -- named for the Southern Triangle or, in French, the Triangle Australe, a prominent constellation of stars in the southern hemisphere -- is a boxy, fairly ordinary-looking floorstander in a cabinet about 50" tall, 12" wide, 14" deep, and weighing about 80 pounds. (The review pair was clad in a beautiful veneer of deep brown mahogany, perfectly applied.) But everything past that first glance revealed that the Australe is no ordinary speaker. Take a look at its base, for instance. An injected-aluminum plate is fastened to the bottom of the speaker cabinet, but separated from it by a 3mm rubber mat to damp vibrations. The back of the base plate is anchored to the floor with two adjusting screws toward the rear of the speaker; the screws can be used to tilt the speaker back a bit or keep it upright. Attached directly to the front of the wooden cabinet (not on the base plate) is a single metal cone that carries most of the speakers weight and is designed to drain internal mechanical vibrations into the floor through a process Triangle calls Single Point Energy Conduction (SPEC). Additional screws at the side of the base plate keep the speaker from tipping easily (nice with small children in the house). The Australes six drivers are linked in a three-way bass-reflex design with a front port. They include a pair of interesting 1" titanium dome/horn tweeters (one facing the rear), a 6.25" midrange, plus three 6.25" woofers linked in parallel to create the equivalent of a single 10.5" bass driver. Despite what one might expect regarding the difficulty of driving three woofers in parallel, the Australes nominal impedance is listed as 8 ohms, its minimum impedance as 4 ohms. Making this load easier still is the speakers rated sensitivity of 93dB. Suffice to say, my preamp settings for the Australes were far lower than what I use for my reference loudspeakers, the Salk Sound Veracity HT3s ($3895/pair and up), which have a claimed sensitivity of 85dB. Triangle states that the Australes frequency response is 35Hz-20kHz, +/-3dB, so I expected good bass extension, though perhaps not as good as that of the Salks, which is specified at -3dB at 29Hz. The Australes driver materials are reportedly the products of much thought and research. The woofer and midrange cones, for instance, are made of a long-fiber cellulose pulp (read: paper), which was reportedly tested against more exotic materials and chosen for how well it preserved "honest sound quality," according to the Triangle website. The tweeter design uses a 1" titanium dome for its inherent lightness, rigidity, and ability to reject distortion. The dome is positioned behind a "pavilion," or horn enclosure, that "controls and extends the response at high frequencies." The second driver faces the rear to create greater ambience. All of the drivers, as well as many other features in the Stratos line, were based on designs developed for Triangles high-end Magellan series. A final piece of engineering worth commenting on is, believe it or not, the Australes cable terminal. The heavy-duty connector includes specially designed and obviously high-quality terminals of gold-plated copper to securely grip standard banana plugs and cables up to 6mm (almost 0.25"!) in diameter. The crossover, too, includes high-quality components (the website doesnt get much more specific), and is mounted right on the back of the connector for "optimum signal conduction." Altogether, a nice touch of engineering that lets you know that the Triangle Stratos Australe isnt assembled from over-the-counter parts. Setting up the Triangles in our own listening room was an interesting challenge. The associated equipment for the task included a Bel Canto eVo4 power amp in bridged two-channel mode, a Bent Audio NOH passive transformer-based line stage, a Cary Audio 306/200 CD player, Paul Speltz Anti-cables speaker cables, and AudioQuest Panther interconnects. That our room lacks some of the bass reinforcement of that San Francisco audition room reflects a choice weve made in favor of bass clarity over selective room reinforcement. Surprisingly, the Triangles distance from the wall on the long side of our room didnt affect their bass output as much as it did with my references, the Salk HT3s, the difference likely being that the Salks ports fire to the rear and the Triangles fire to the front. Closeness to the wall did, however, affect the clarity and presence of the Triangles midrange. I finally settled on placing the Australes about 6" closer to the wall and about a foot closer together than the Salks, to maximize the tonal quality and the size and depth of the soundstage. When I fired up the system for a first serious listen, my initial impressions were mixed. On the up side, the timbres of instruments and voices sounded as realistic as Ive heard in my system, and better than with the Salks. The overall balance was also outstanding, the Australes presenting the sound more evenly across the frequency spectrum. While at first the soundstage sounded distinctly smaller than with the Salks ("Why is the soundstage so tiny?" was the alarmed question from my audiophile friend Larry when I first hooked up the Triangles), this was largely remedied by a lot of fussing with speaker placement and sound-absorbing materials. But other issues remained. With respect to conveying detail, I knew that the Triangle Australe was up against a formidable opponent -- the Salk Sound Veracity HT3 has some of the best drivers in the world. As expected, the initial impression immediately after hooking up the Australes was that they werent as detailed as the Salks. But this was only partly due to the difference in drivers; the main culprit was the Australes grilles, which definitely needed to be removed -- as theyd been during our audition in San Francisco -- to present all the detail the speakers were capable of. In fact, taking off the grilles (including the one on the rear ambience tweeter) made a greater difference in the sound than removing the grille of any other speaker Ive heard. That simple act of liberation converted the Triangles from distinctly hazy to nearly as detailed as the Salks. The Australes grillecloth is supported by a fairly wide plastic frame that comes close to blocking the edge of some of the drivers at any angle other than straight on -- I urge Triangle to take a look at changing this design. Another aspect of conveying clean, accurate detail was more integral to the Triangles design. There was initially some loss of high-end detail and coherence due to the rear-facing ambience tweeter. Its true that there was a greater sense of presence with the ambience tweeter playing, but it required careful adjustment of the rooms acoustical treatments to minimize the loss of detail and coherence while retaining that sense of presence. It took some effort, but it was worth it to get it right. The treble was clean, yet full and present. There was a similar interference problem with sound from the front-facing bass port. Everything from the deep bass up through the midbass sounded a bit "muddy" (in Larrys words). One of my favorite tunes for listening to deep bass and its interaction with midrange and treble detail is Hugh Masekelas "After Tears," from his 2005 album, Revival [CD, Chissa HUCD 3093]. In this tracks first two minutes, you can evaluate the clarity of the bass guitar on its own as well as hear how the bass affects the sounds of the other instruments. Experimenting a bit by partially covering the Australes ports, or narrowing them using foam tubes (of the pipe insulation variety), resulted in noticeably cleaner bass and midbass. But to keep this in perspective: During the San Francisco audition, the Australes bass performance was as good as or better than that of other fine speakers in its price class. Nonetheless, I hope that Triangles designers will look at this issue, too, in future models. Overall, the Triangles bass was not quite as deep as the Salks, as expected. But the Australes ability to distinguish bass sounds and timbres from each other remained impressive. The distinction that had wowed us in San Francisco -- between Pat Barbers bass player and her own piano playing bass notes in unison -- sounded equally good in our own listening room. The dramatic impacts of bass transients that the Simaudio W8 stereo amplifier had been able to create during that demo was beyond the reach of my Bel Canto eVo4, even in bridged mode (my power of memory of particularly dramatic audio moments seems to be a bit better than for ordinary comparisons), but the Australes sensitivity allowed them to create satisfying drama with the eVo4. Midrange instruments and voices at first had a bit of texture and grit, but running the Australes for several days resulted in smoother, more convincingly real sound. The Salk Veracity HT3 uses a very fast and highly resolving Seas Excel midbass driver with a magnesium cone, but the realistic timbre of the Triangle Australes paper-cone midrange won the day with both womens and mens voices. Similarly, my interest in classical music, both chamber and orchestral, was well served by the Triangle. When a speaker can get a violin, cello, flute, and oboe to all sound like themselves, and full orchestral and choral passages to not devolve into mush, thats an accomplishment. The Triangle achieved that goal competently, though it perhaps lacked that last degree of resolution in the most complex passages. The Triangles treble was detailed and had fairly good extension, though not as much as the Salks Aurum Cantus ribbon tweeter. The broad range of cymbal sounds in Eva Cassidys cover of Paul Simons "Bridge Over Troubled Water," from Live at Blues Alley [CD, Blix Street G2-10046], was distinct and impressive, each touch on the instruments having its own character. Although the transparency of the Salks ribbon edged out that of the Triangles dome, the overall balance and accuracy of the Australe and the detail it pulled out of the music were impressive. In the Stratos Australe, Triangle has created an excellent multipurpose loudspeaker that does a convincing job with a wide variety of music. Its sensitivity would make the Australe a good partner with most amplifiers, and its ability to accurately depict instrumental timbres should make it a fine complement to tube amps of more recent design. Even more than that, however, when up against stiff competition from other speakers in its class, the Australe proved itself an overachiever and more than held its own. If your taste runs toward live recordings, particularly of acoustic instruments and voice, the Triangle Stratos Australes realistic timbres and presence make it a worthy contender. 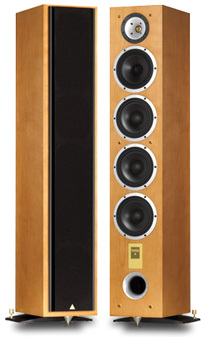 Price: $5699 USD per pair.